U.S. Navy ships often have to traverse dangerous choke points that make them susceptible to attacks. To mitigate that risk, the Marine Corps often rolls out tactical vehicles on the ship’s deck to beef up security. The Corps did just that on Jan. 12, when the Wasp-class amphibious assault ship Kearsarge, hauling Marines, sailors and Harriers embarked with the 22nd Marine Expeditionary Unit, or MEU, transited the Suez Canal. 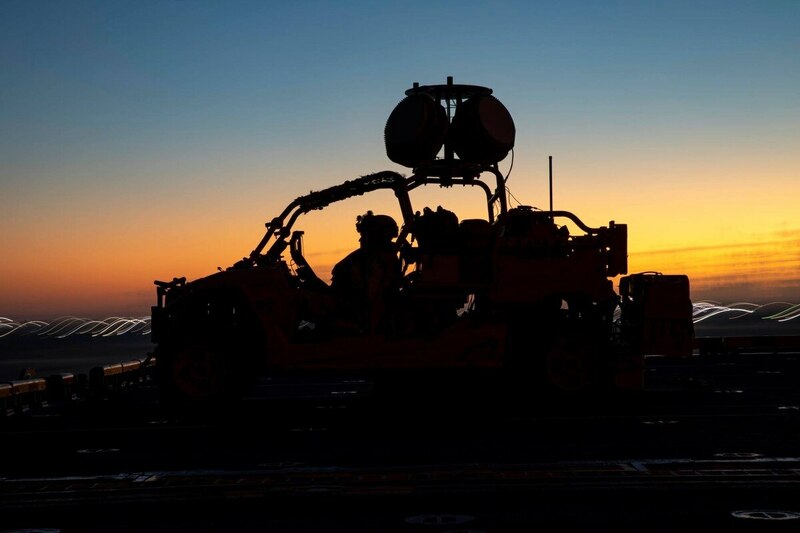 But this time the Marines strapped down its latest toy, a new counter-drone system known as the Light Marine Air Defense Integrated System, or LMADIS. The system was actively scanning the sky for small drones that could pose a threat to the ship, according to Capt. Joshua Smith, a spokesman with the 22nd MEU. U.S. warships and MEUs setting sail from the East Coast of the United States generally sail through at least four major choke points ― the Strait of Gibraltar, Suez Canal, Bab al-Mandab Strait and Strait of Hormuz ― as they head into the U.S. Central Command area of operations and the Persian Gulf. Some of these waterways pose a major threat to American vessels, and have often been the site of attacks on commercial shipping by militia and nonstate groups. The Washington Institute, a D.C.-based think tank covering the Middle East, detailed attacks by the Yemen-based and Iranian-backed Houthi rebels on commercial ships transiting the Bab al-Mandab Strait, a narrow waterway that in some places only separates the coast of Yemen and Djibouti by 20 miles. The Houthis have carried out attacks ranging from rocket strikes to even a drone boat attack on an oil terminal, according to the Washington Institute’s report. The attacks underscore that even in low-intensity conflicts, small terrorist groups and militias can hone near state-like powers to disrupt global shipping and harass military warships in the region. The proliferation of drone technology to these organizations only exacerbates that threat, especially as the technology in small commercial drones weighing under 55 pounds is moving at light speed, and the ranges of these system are rapidly expanding. American vessels transiting the Strait of Hormuz have often been harassed by small Iranian fast boats. In October, two Iranian boats approached the Wasp-class amphibious assault ship Essex while U.S. CENTCOM commander Gen. Joseph Votel was on board. The U.S. Navy characterized the interaction as “professional”, but in the past that has not always been the case. Navy Times detailed that an Iranian drone flew within 100 feet of Navy F/A-18, forcing the American aircraft to take evasive measures. 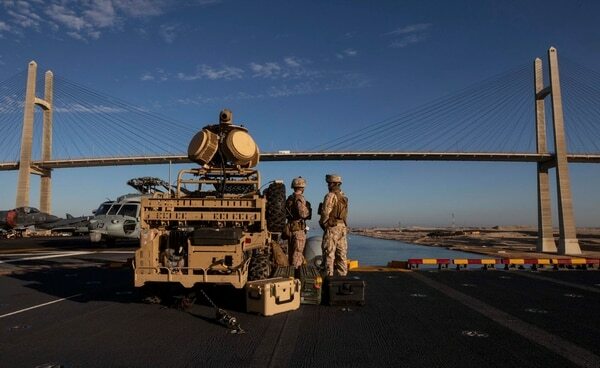 The counter-drone system embarked with the 22nd MEU is not the vehicle’s deployment debut. The LMADIS is also currently deployed with the 13th MEU, and photos of it were posted online where it was used in Theater Amphibious Combat Rehearsal exercise in Djibouti in the fall. Smith said the use of the LMADIS during the Suez transit was not meant to replace any of the ship’s existing capabilities, but merely to provide additional security to the ship’s defense systems. 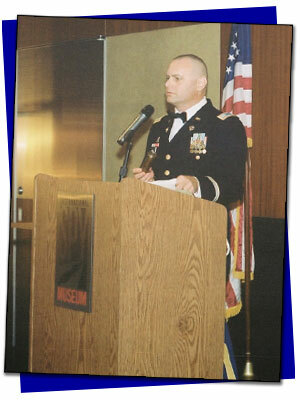 Marine Maj. Gen. David. W. Coffman, director of Expeditionary Warfare for the Chief of Naval Operations, said in November while speaking at the Hudson Institute that the Corps was seeking ways to make Navy ships more lethal by integrating Marine assets. “Can you get creative on it? I think you could. I can tell you I watched a MEU commander strap an LAV to the front of a flight deck because it had better sensors than the ship did to find small boats,” Coffman said in November. The Marine Corps strapped a light armored vehicle, or LAV, to the deck of the amphibious assault ship Wasp with the 31st MEU, where it carried out a ship defense drill in the South China Sea. The LAV fired its M242 chain guns as it shot at small surface targets, practicing a run through a small narrow waterway. “This was the first time that an LAV-25 platoon with the 31st MEU performed this level of integrated targeting and live-fire from the flight deck of a ship such as the Wasp with combined arms,” Capt. George McArthur, a spokesman for the 31st MEU, previously told Marine Corps Times. “We will continue to seek opportunities to employ, test and and exercise its capabilities as needed,” Smith said about the LMADIS during the Suez transit.